We congratulate our winners in the Division 1! We congratulate our winners in the Open Division 2! We congratulate our winners in the Open Division 3! Thank you for the great time in Puget-sur-Argens! Despite the best efforts of mother nature, we ended our first event of 2017 in the sun on time and with some amazing paintball played. This was in no part due to the hard work & efforts of our crew who had to make safe and repair fields in double quick time under very testing conditions and to the great Refs who stayed out all day in torrential rain ensuring all games were played and played to their very high standards. And of course, to all players who played on regardless. See you all in Bitburg! 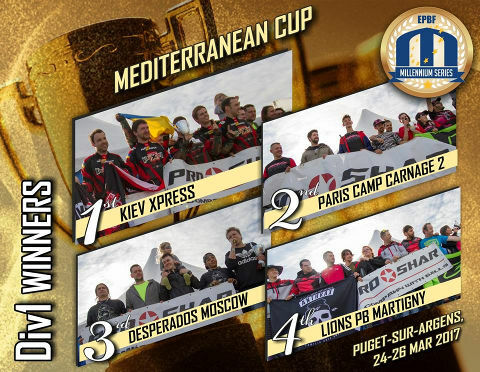 All results of the Mediterranean Cup in Puget-sur-Argens are online now, the CPL draw for the European Masters in Bitburg as well here. 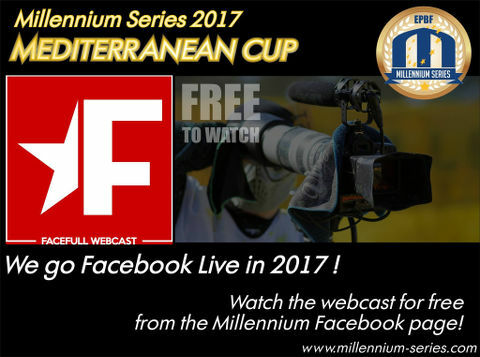 The Millennium are pleased to announce that all our events in 2017 will be broadcast live by our friends Facefull. Whats more it will be 100% FREE to view on Facebook Live. All you have to do is go to our Facebook page Millennium Series ltd follow the link, Friend us to get all the updates and action straight to you. Then sit back, relax and watch all the live action on the CPL field plus interviews and news spots all event long. This is a light weight live and interactive webcast bringing all the action FREE to all. Watch the best teams in the world battle it out at the first round of the best event in the world. We welcome you to our Trade show in Puget-sur-Argens! We welcome the third squad of the Droogs Frankfurt to Division 1! 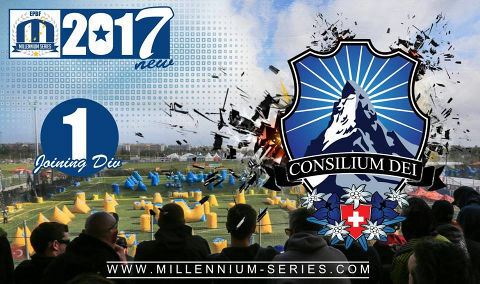 And we welcome the legendary CONSILIUM DEI from Switzerland to Division 1! Finally! Best of luck, guys! 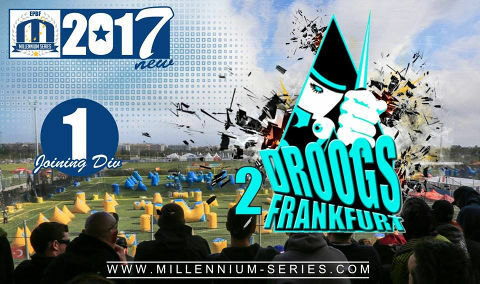 We have one more German team in Division 1 this year - Droogs Frankfurt 2! Welcome and good luck, guys! 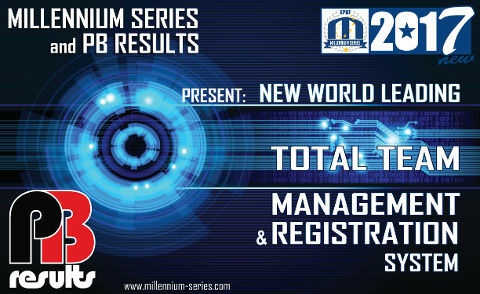 The Millennium are pleased to announce that we are launching our new Total Team Management and Registration System in partnership with PB Results. After much work & development, this system will go live from Friday the 17th of March 2017. 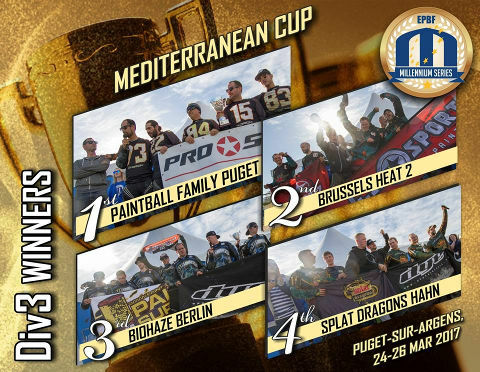 This new and comprehensive management tool will revolutionise Paintball team management not only for events such as ours, but for teams and events large and small across the globe. Team managers will be able to search out players, players can find teams, they can register for events, keep player and team history, players history and all the data that goes with them. All teams and players will have their own unique worldwide ID. And this is just for a start, we have many exciting new tools in the pipe line to aid team managers and players that will be part of our constant development. 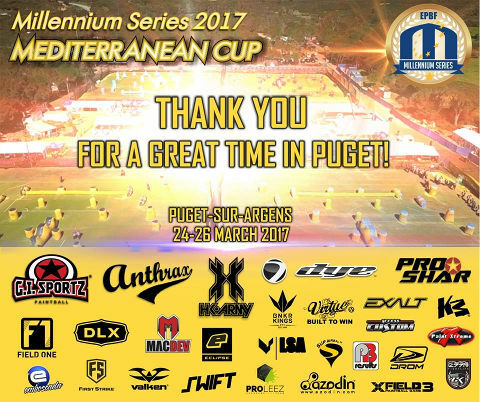 So, to the Millennium Riviera Cup. What do you do and how will affect teams and players already registered? It’s simple if you have already registered all your data has been transferred from us to the new system for you. All team managers will be receiving an email during and after this Friday, the 17th of March 2017 with their log in and ID details, all players will also receive the same. For teams, yet to manage rosters and new players you just go to www.pbresultsonline.com, at PB results and complete their very simple account set log in on line. All players can then download their ID to any smart device. When you come to register at the event you show this, we scan it and get you booked in as normal. Just like an E boarding pass for flights now. Why the change? To make the whole registration system faster and more reliable and more secure for all. The main point is to give teams and players control of their own accounts, to track performance at events teams played, allowing the list to grow and grow. 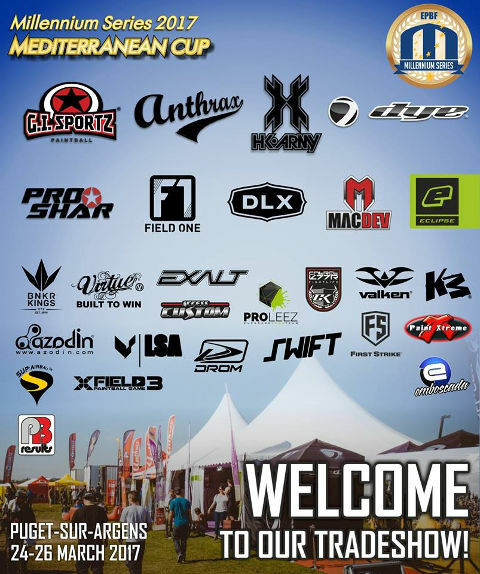 We are investing to bring paintball in line with other sports and future proof technology as we move forward. Also, to improve security at events for players, ensuring a more effective way of only allowing the right players into the fields at the right time. So now your ID is held at each field and can be brought up at the touch of a pad. Don’t worry you don’t need to carry your smart phone with you to the fields, all access will be controlled by each field, each team will go to field as normal. Managers will select match roster and pit crew for that match, and players and pit will be checked as they enter Logging each player so you will be able to start tracking games played at which events by player and team. 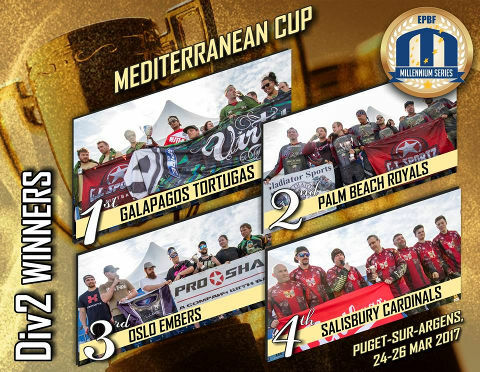 So, look out for your email from PB Results and start exploring and making the most of this new and exciting advance in paintball.